Darling is the story of a young woman (known only as Darling), who takes a house sitting job at a house that has a horrific history. Not long after she settles in the woman begins to have terrifying visions and begins a descent into madness. The history of the house being watched hints at tales of possession and invoking the Devil. The film is even broken up into several chapters bearing titles such as “Invocation” and “Demon”. The 'house with a history that drives its inhabitants insane' is nothing new, but the execution of Darling and the way the film not only tells its story but shows it, is nothing short of breathtaking. Darling is art house horror at its finest, it's not just watching a movie, it's experiencing a visual and audible nightmare. The movie has a surreal and unsettling way of making the viewer feel as though they are not watching a movie, but are rather watching HER, the young woman. In turn, it feels as though Darling is watching YOU. As the viewer, I felt I WAS the evil presence inside the house. I felt like an invader. The filmmakers, whether they know it or not, have stumbled on a filming technique that made me feel involved in the experience of what was happening on the screen. I almost felt responsible for what was happening to Darling yet sympathetic toward her at the same time. It's voyeurism to the max and I was blown away by the simplicity of the approach to tell the story and the devastating affect it had on me. While the filmmakers of Darling deserve a ton of credit and kudos for what they have achieved, all their efforts would have been for nothing without a strong performance from Lauren Ashley Carter. I can't say enough about the fantastic and heartbreaking performance that Carter gives. She pushes herself and the audience to the limit in a brutally intense portrayal that still manages to keep our sympathy. Darling's descent into madness is not her fault, and for Lauren Ashley Carter to be able to pull off the ferocity of her condition while maintaining the humanism of her character is nothing short of remarkable. Her big eyes are filled with pain, innocence, aggression, and nothingness at the same time while her face is tense and seemingly restraining itself from screaming all while her body is apathetic and controlled. It's just a remarkable performance. I'm in awe. The music is piercing and uneasy, the atmosphere is filled with dread and fear and the unexpected, and my heart was pounding the entire run time. Mickey Keating has created a timeless horror classic and a brilliant portrayal of possession. There's blood and terrifying visions and moments, but there's no demons or over the top moment of possession or anything like that, just the descent and nightmare of a young woman shown in outstanding fashion by Lauren Ashley Carter. 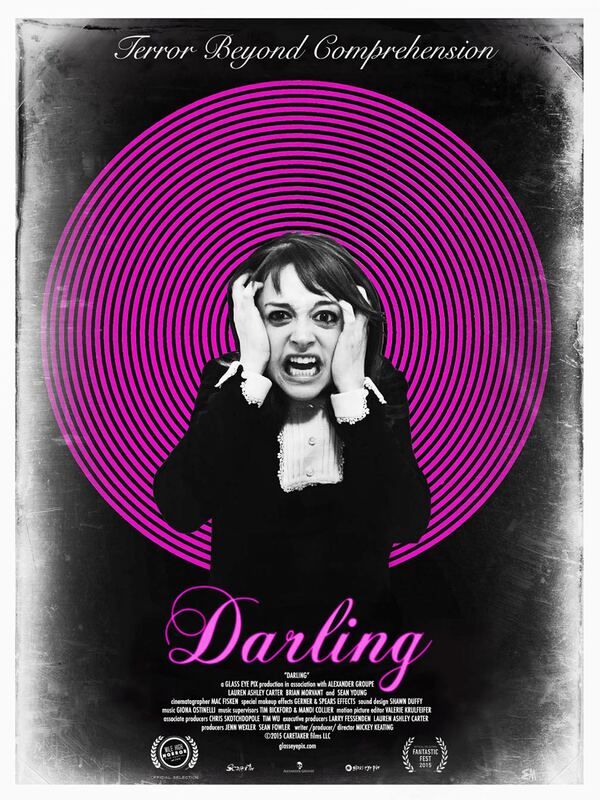 Darling is horror in the purest and truest sense and I would highly recommend it to anyone.